I always get excited when I hear that Josi Kilpack has another book out! She has such a fun writing style, and is good at allowing the reader into the hearts and minds of her characters. She has written about a wide variety of characters in different settings, and they always seem to become some of my best friends. When I heard about this new book I may have done a little happy dance. The cover art is beautiful, the title is fun with alliteration, and I couldn’t wait to meet the characters and delve into this world of primroses. So what did I think? 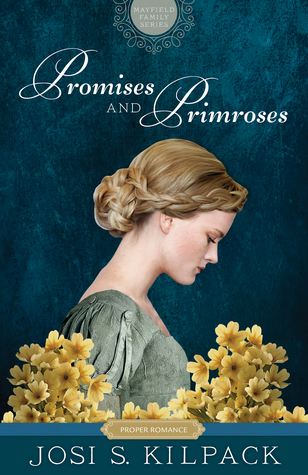 Find out in my book review of Promises and Primroses by Josi S. Kilpack. “Lord Elliott Mayfield has done his best to take care of his family, first his siblings and now his nieces and nephews. Unfortunately, he sees this new generation moving in the same direction of bad matches and scandalous relationships as the last. In hopes to change their course, he establishes a ‘marriage campaign’ to motivate them to improve themselves through making respectable matches. With his heart in the right place, what could possibly go wrong? Hahaha! Can you imagine your uncle coming to you and proposing that he will give you a very large gift (money or something else) if you decide to settle down and get married to a respectable person? I have to admit that it might be tempting–as long as I already had a fiancée. It might be a little weird otherwise. People just don’t talk like this anymore. Of course parents want their children to marry good people, but thankfully it’s not the same as it used to be. Again, thankfully, women have a lot more options now than they did back then. I’m so glad that times have changed on that one! I love Julia’s character. She’s so sweet and tenderhearted. I loved how cute she was with the little girls in the story. It was fun to read about the tea parties, the games, and the love she had for them. I liked that she thought independently, she didn’t care what her mother thought, and she did what she thought was best for herself. After learning about Julia’s mother, I don’t blame her for wanting to get out from her mother’s thumb. Peter seems like a good man. He may be a little too blinded to see what’s important sometimes, but I think he has good intentions. It was interesting learning about the dogs and some of the care that went into them. I know that scandals in families still happen, but thankfully, I don’t think they affect the whole family for generations like they used to. Peter worked very hard to prove himself despite his family’s reputation, and I liked that he put that effort into rising above his circumstances. I liked the easy-going writing style of this book. It’s well written, has great character development, and is a sweet story. I did think it was a bit predictable and a little cheesy in parts, but honestly, that’s what I want in a romance. Right? Love stories need a little cheese and a few “awwww” moments! It’s fun and entertaining, and I enjoyed it. I liked how it all came together, and how the characters fit together in the story. It’s a fast, easy read; I read it in a couple of days, and loved that I could get sucked into this fun world of promises and primroses.